Cindy Jenson-Elliot is a children’s book author and environmental educator. 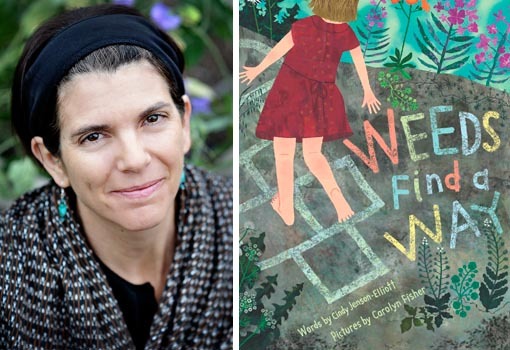 Her latest book, due out in Feb 2014, is ‘Weeds Find a Way,’ a lyrical nonfiction picture book about weeds and their adaptations. It is illustrated by Carolyn Fisher and is published by Beach Lane Books, an imprint of Simon and Schuster. I currently write nonfiction for children of all ages, as well as articles for adults. My focus is often nature, but I write about anything I am assigned to write about, as well as projects close to my own heart. Henry: I write fiction for kids, but I’m always sprinkling nutritional nonfiction nuggets in the recipe. What do you hope readers will get from reading your latest book? What I hope people get from reading this book — and all of my books — is a new way of looking at something that they see every day. I hope they notice something that they never noticed before — something plain and ordinary, and see how extraordinary it really is. I hope they have a new appreciation that nature is all around us, even poking out of urban pavement. I did a column for my little community newspaper for many years that was just called “Nature Journal” about what I was noticing in my neighborhood. I wrote about birds and worms and trees and mammals and weeds. I got so many comments about that locally — people really want to get to know their natural neighbors and love seeing the wonder in their own backyards. Henry: I’ve got a scifi early chapter book that is very much aligned with your idea of getting readers to look at things in new ways, and see the extraordinary in the common. The most challenging part of writing for me is the long process of discovering how to frame a nonfiction piece. I usually start with what I know, then write down what I don’t know and want to learn about a topic. Then I research. Once I have collected a mass of research, I consider different ways of approaching the topic, often writing as many as 40 drafts of a book — many with completely different approaches to the topic. There are a thousand ways you can write about any subject — so what is the right way to write about a particular topic? What is the best way to explore and topic and share it so that kids understand the topic? Once I have decided on that, everything becomes easier. I pondered the subject of weeds for about a year and a half before I wrote ‘Weeds Find a Way’. I needed a book about weeds because I was teaching gardening and there were no books for children on that topic. But it took awhile to decide what I wanted to say about them. My advice for aspiring authors is just to write, write, write. Find as many venues for your work, in any genre, for any audience that you can. Every type of writing strengthens every other type. Get assignments and turn them in on time. Embrace editors — they are your friends, even when you don’t like what they say. They are our clients and teachers, and we can learn so much from them. Give yourself time to learn. Writing is a lifelong process. I like this quote because it speaks to the permanence of nature and nature’s ability to recover, even in the face of our bumbling and mistakes. It speaks to the hope that is always waiting for us beneath our worries. I think it’s important to give children a love of nature first, and a wonder of what they encounter. Problems and environmental challenges can be introduced later, when they already have developed a strong bond with nature and an understanding of its cycles and healing nature, and when they are mature enough to know they have the power to change the world. Introducing problems before love, and without empowering children to change the world leads to despair. I want them to see the wonder of nature through my books. That’s tough for me. I read constantly, but am terrible about remembering what I read. I remember mostly just the visceral sense of beauty of a piece of work. I am always blown away by writers in the New Yorker magazine — the way they come up with interesting topics and really get into it. I enjoy narrative nonfiction. I just read ‘Behind the Beautiful Forevers’, and would love to meet the author Katherine Boo. Last summer I read the autobiography of Zora Neale Hurston, ‘Dust on a Road’ was the title, I think, and I would have really enjoyed meeting her. And I adore the book ‘Wandering Ghost’, a biography of Lafcadio Hearn. I wish I could have met him. But in person I am pretty shy, so I would probably be tongue-tied around any of these people, so dinner would be a quiet, dull affair, I’m afraid. I wouldn’t mind dinner with Sonia Sones. I love her lyrical novels, and I actually met her at an SCBWI event and told her how much her work means to me, but felt too shy to talk much. I also love the work of illustrator Kadir Nelson — especially his interpretation of the poem Ellington Was Not a Street. But, again, what would I say? I’d just like to listen to these folks talk and see what I could learn. When I am not writing, I spend time with my family, camp in the High Sierra and Big Sur, garden in schools and at home, do long-distance swimming in the ocean, bike and teach. Tombstone? No tombstone. Perhaps just a rock somewhere that says, “Thank you”. In the end, I think that’s all we are left with — our gratitude for being able to share this lovely world. Readers can find my work on my website at http://www.cindyjensonelliott.com. This interview is also posted on the San Diego Children’s Books Examiner. Categories: Books, Conservation, Nonfiction | Tags: author, Conservation, ecology, environment, interview, nature, weeds | Permalink.